Some utility work was being done this week in advance of the Belmont Street culvert job. 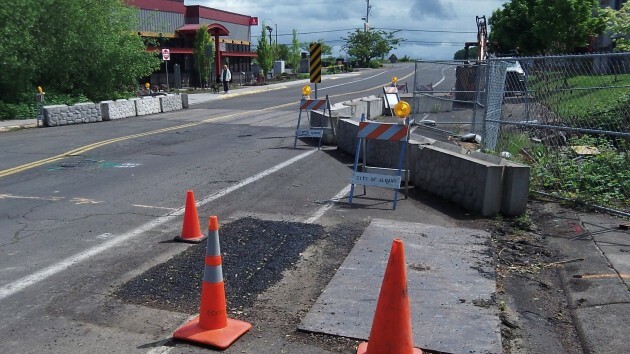 It was March 11 when last you read in this forum about the “Culvert on Belmont Street,” the Albany street repair project that should be straightforward for a contractor to get done but proved more than a little complicated in the paperwork department. Now, thanks to a young Albany public works engineer, a milestone has been reached and a contract will soon be let to get the street fixed. Belmont Street is off Pacific Boulevard in southwest Albany, near Linn-Benton Community College. High water in the flood channel under the street damaged two culverts and undermined the pavement in January 2012. The city made temporary repairs, but a permanent fix had to wait The Federal Emergency Management Agency allocated up to $700,000 to undo the flood damage, but before the work could be done it had to be cleared with several state and federal agencies. After all, the seasonal channel might harbor specimens of a threatened fish species or two. It took a long time to get through the paperwork, which included references to “biological opinions” and even the completion of a survey for rare plants. And it would have taken even longer if Christopher Goins, 31, a civil engineer in the Albany Public Works Department, had not figured out a way to cut the process short. He learned the project could go ahead if he obtained a letter from Oregon Fish and Wildlife that the work would have no bad environmental effect. He asked for and got the letter, and now things are set. Goins reports that eight bids were opened on April 22, and North Santiam Paving of Stayton submitted the low bid of $484,100. (FEMA is paying 75 percent and the city 25 percent.) Goins has not yet seen a schedule from the contractor, but he says the work must be done within the “in-water-work window,” which is from June 1 to Oct. 15. The plan calls for replacing the two damaged 48-inch culverts with a three-sided box culvert, 12 feet wide, six feet high and open at the bottom.